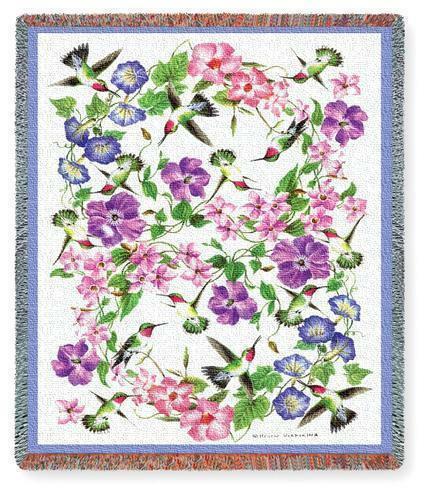 "Hummingbird Throw" A flock of hummingbirds flitter and flutter around brightly colored hibiscus and other flowers. This makes the perfect gift for the hummingbird lover! Woven on Jacquard looms. Cotton. Machine washable - gentle cycle, cold water. Tumble dry on low heat. Measures 54" Wide x 70" Long. PLEASE NOTE: Shipping ONLY within the continental U.S. Hawaii, Alaska, and Puerto Rico must contact seller for shipping quote before ordering.